How many times have you seen an aircraft kit that represents the transparent wingtip light covers as a panel line in the plastic and leaves you to paint the light? If you're building the Beaufighter, that doesn't work so well since there are two transparent covers on each wingtip and both are clear! Yep, many folks will paint them silver and call it a day, but others will cut out those sections and replace them with clear plastic from a variety of creative sources. 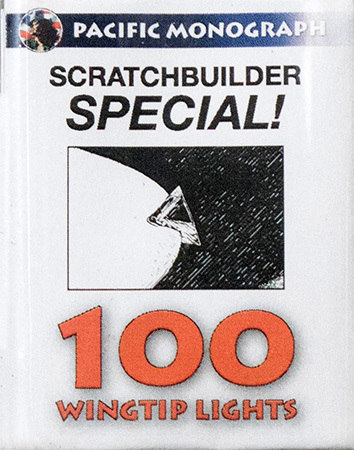 Pacific Monograph has provided a solution that will work for kits ranging from 1/48 to 1/24. These are pre-cut lens shapes that are really triangles that are ready to be bonded into place and shaped as required. Each transparent block provides 20 lenses and there are five transparent blocks included in each set: one red, one green, one blue, and two clear (the clears are still in their protective paper which peels right off). In the case of the Beaufighter and similar installations, remove the opaque light covers from the wingtips, use cyano or 5-minute epoxy to replace them with the appropriate clear or colored lens(es), and once dry, use sanding sticks to shape the lenses to match the wingtip and then use finer grips of sandpaper, sanding sticks, and/or sanding pads to remove the scratches and polish them back to clear. This set is the first of a series of modeling products from Pacific Monograph. You can purchase your own set or see other interesting products on their website at http://www.pacmonoshop.com. My sincere thanks to Pacific Monograph for this review sample!